No matter how many times I’ve been here before, I still feel nervous ordering. You need to know what you want to order. Man, da pressure is a lot for an indecisive guy like me! 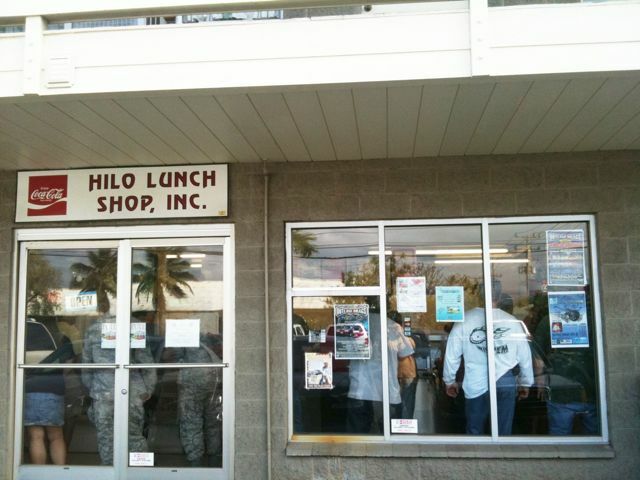 I always refer tourists here for a great lunch… you know, somewhere the real locals eat. But if even I’m intimidated ordering here, I feel bad for the uninitiated! I just hope to help a little bit. I’m not even sure if I’m doing it right myself, but so far so good. 1. Get here early! Before 11am, or else the best stuff will be sold out. 2. Know what you like order before stepping in the door. Or at least be ready to be experimental. 3. No cut in line or else you going get mean stink eye! The line may wrap around to the right so be sure to know where the line starts. Be nice. It can get pretty crowded. 4. Once in line, check out the food and finalize your order as much as you can in your head. Listen well to the people ordering to get a feel of everything and what’s good. 6. Order a musubi (or 2), or a few maki sushi. You need rice with this salty tasty cuisine. They have anykine. Most popular it seems is the spam or plain musubis and sushi. They have a great maki sushi which uses mustard cabbage instead of nori. Their cone sushi is well done. I prefer keeping it simple with a plain musubi or some sushi. 7. Order some main items. Just choose what looks good to you. Ask questions if needed but keep it short. If you will be eating this later for a picnic or want something easy to pack, you may want to choose drier items. Otherwise, anything goes. 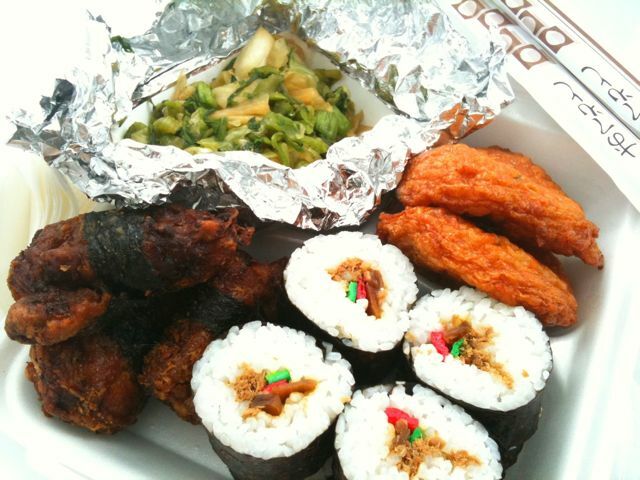 My favorite must-haves is the nori chicken and fishcake. Other amazing items are their tofu cakes, fried chicken, breaded ono, and any of their tempura. You can’t go wrong with any of these. 8. On the far right, don’t miss their choices of pickled veggies and salads. These all go great with their food. I chose some pickled mustard cabbage this time. For a real plate lunch get a scoop of mac salad. 9. Your practically done. You’ll be asked “fork or chopstick” then you pay! Cash only. 10. Now head to the beach, and grind!!!! Hope this helps people. Follow these steps and you will not hear, “No sushi for you!!”. Feel free to add on any recommendations yourself. This entry was posted by James on Wednesday, February 3rd, 2010 at 11:27 am	and is filed under Hilo, Japanese, Okazuya. You can follow any responses to this entry through the RSS 2.0 feed. You can leave a response, or trackback from your own site. Glad to see the okazu-ya lives on in good ole Hilo! LOL! Love this post. I miss the mustard cabbage sushi. When I used to work for the airlines people would always bring some to the office! brah….awesome post….i remembah giving stink eye to one or two tourists who wen hold up da processes….cone sushi and nori chicken were always a must. James, Okazuya shops here on Oahu are the same way. If you get there when there’s a crowd, you better know what you want, or you’ll get “stink eye” from folks in line behind you. Watching The Food Network, I see there’s a similar protocol at competing Pat’s and Gino’s Philidelphia Cheesesteak stands in Phili’. “Cheese ‘wit? Or Cheese ‘witout?, heh?”(with or without onions that is). Any other okazu-ya shops you planning on going to? Awesome advice! Be sure to post http://tinyurl.com/26okadh and tell others!